When it comes to customers, are marketers better served focusing on acquisition or retention? And what’s the proper balance of each? Any marketer worth his or her salt knows that the most valuable customers, and your biggest source of business growth, lies with your current customers. As such, the most valuable time to build relationships with your customers is post-sale. Think about it: A current customer has already said yes. They already trust you. They trusted you enough to buy, anyway. Focusing on those customers post-sale is without question, the most important part of developing an ongoing relationship with them, and it’s not at all hard to do. Let’s explore. When it comes to customer retention, marketers are historically short sighted, as are their counterparts on the sales team. While acquisition has traditionally dominated retention as it relates to marketing strategy focus, in fact the statistical evidence points firmly towards a solid retention strategy as delivering the best ROI. The fact that we’re still talking about this amazes me: I remember learning this in my earliest days in marketing—in fact, it’s pretty much Marketing 101. Yet we still see sales teams chasing new customers and marketing teams equally focused on acquisition as well. 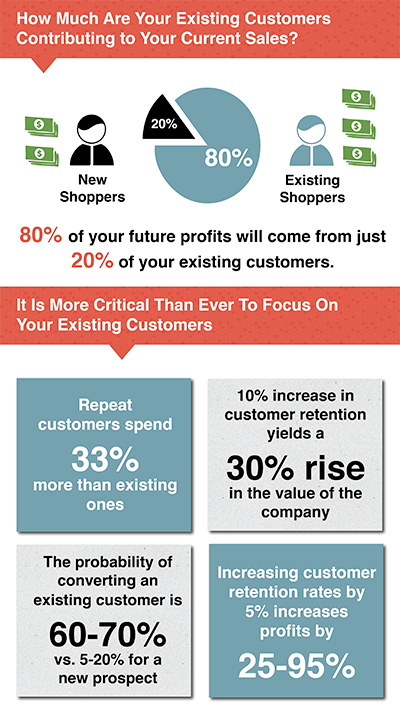 Consider the stats laid out in this infographic from Retention Science. It’s easier (and more exciting) for both sales teams and marketers to focus on drumming up new business. A customer retention strategy takes time to produce returns and marketing departments (and sales teams) are under constant pressure to produce short-term results. The return on investment for customers over the long-term is harder to measure than new customer sales and, therefore, harder to justify. For those who understand the value of retention (or who want to), embracing a customer lifetime value (CLV) mindset is key. CLV is a model that takes a long-term view of customers, estimating the value of future cash flows, and not just historical sales. It’s a complex subject that I’m not going to get into here in detail but if you want to explore this more fully, I highly recommend you read Avinash Kaushik’s Guide to Calculating Customer Lifetime Value. I love his blog, and his big brain, and once you read this guide, I predict you’ll be likewise enamored. More importantly, thinking about CLV as he breaks it down will help you as you create your own customer retention strategies. The point is that while the majority of companies see value in CLV as a concept, only a minority report that they are able to put it into action. 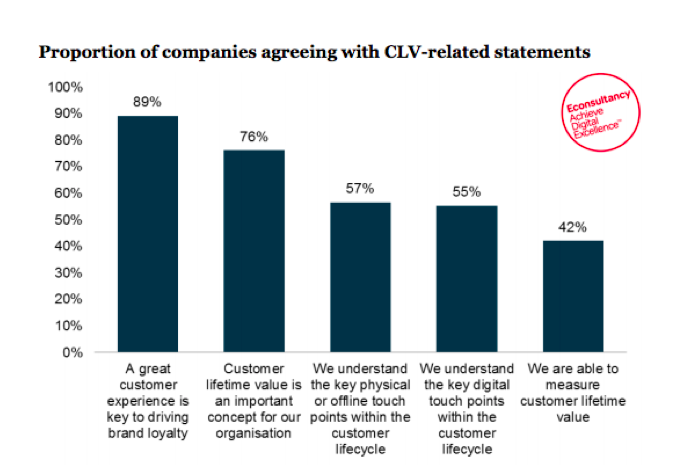 According to an Econsultancy study more than three-quarters of companies (76 percent) considered CLV to be important, but less than half (42 percent) actually said that they were able to measure it. Worse still, just 11 percent said that they “strongly agree” that they could measure CLV, meaning that a mere one in every ten companies would appear to have fully grasped the concept. Provide memorable customer service. That means empowering your front line staff (online or off) with real time customer information, so that questions can be answered and issues resolved without delay. You want to be proactive, rather than reactive, and build good relationships by meeting—even exceeding, where possible—customer expectations. Listen and learn. Encouraging feedback from customers, both positive and negative, is a great way to understand their likes and dislikes, as well as their needs and wants. Monitoring reviews and social commentary on your brand can provide invaluable insights into what customers are looking for. Everybody likes attention. Feature your customers, and their stories in your eNewsletter and/or by way of short video interviews that can live on both your website and your YouTube channel. Reward Loyalty. Build strong loyalty programs that reward ongoing business. Customers may like patronizing your business, but they’ll like you even more if you reward them from time to time for being a great customer. This is easy to do, and can be very cost effective, yet go a long way toward establishing strong relationships. Remember that Referrals are a Gift. A referral from a satisfied customer is the best kind of gift—don’t take that for granted. Don’t forget to establish referral programs that reward customers for sending you business. Pay attention, pay it forward. Find and follow your customers in social media channels. Share their stories, support their marketing efforts, introduce them to your other customers. Relationships are a two-way street, so remembering that, and putting that into action can go a long way toward building customer relationships that are long and mutually beneficial. Social media makes that easy. Once you’ve got the relationship-building part under control and in process, know that you do need to continue to touch and educate your customers about the other things you do and sell and how you might serve them. As an example, we once had a customer who sold aluminum bleachers to schools and community centers. When I asked about what happened after the sale, our client said that the last contact with a customer was a “your product has shipped” email notification and that was that. What they weren’t taking into consideration is that their clients largely found them online and, once the sale was over, they risked being forgotten by customers who might not remember where they purchased. Those same customers, however, might also need things like gym flooring, soccer goals, basketball goals and nets, or pool equipment. But they weren’t staying in touch in any way at all with those customers after their initial purchase, or making any effort to let those customers know other ways they could be of service, thus making those other sales largely impossible. We changed that and guess what? They sold more stuff as a result. Whatever tools and tactics you use to develop a retention strategy, it should be built around one clear goal: Building a post-sale relationship with every single customer is the key to business growth and profitability. Court new customers for sure, but don’t ever lose sight of how valuable your existing customer base is. And make sure your marketing efforts are designed to keep those existing customers top-of-mind. What loyalty and retention strategies do you employ for your business or for your clients? What do you have to add to the list above? I’d love to hear what’s working for you and any lessons you’ve learned along the way. This article was originally seen on The MarketingScope.